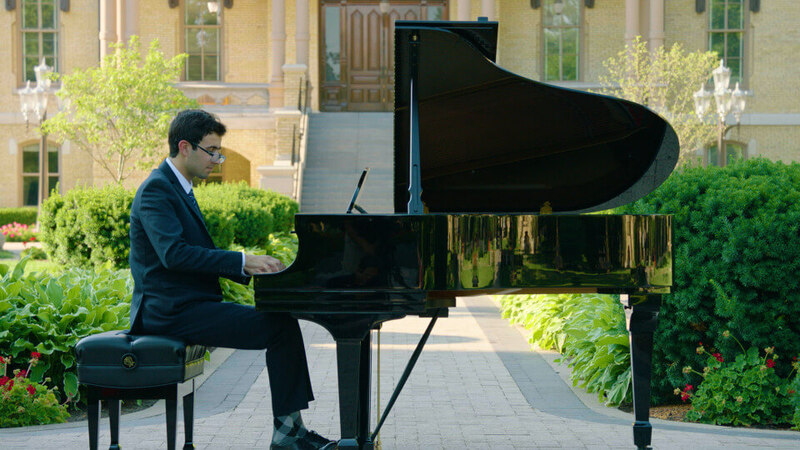 Alex Mansour, a junior music and FTT major, is an accomplished cello and piano player. Notre Dame junior Alex Mansour admits he’s not much of a sports fan. Yet, when confronted with a crunch-time challenge, the music and film, television, and theatre major came through with a prime-time performance befitting any Irish athlete making a game-winning play. Mansour’s assignment? Create the musical score for the 80-second video that would be shown on the Notre Dame Stadium video board just before the Irish team took the field. Three days before the 2017 Irish season opener against Temple, the video remained incomplete — and Mansour was on the spot. The end of the video piece, featuring game-action shots of current Irish players, needed more pizzazz. But time was running thin. He locked himself in an audio booth with his laptop and keyboard, and by 3 a.m. he had a final product. Thanks to a recommendation from Notre Dame film, television, and theatre faculty member Ted Mandell and another from recent Notre Dame graduate Kevin Barrett (a current Fighting Irish Media intern whose fiancee is a music major), Mansour became the ultimate behind-the-scenes contributor to the 2017 Irish football season. “It was pretty neat,” Bonner said. "Ted told me he had an FTT student who is really amazing, could compose music, and was very much into the video world. Ted was convinced he could be valuable to what we were doing. “So we met before school ended and went through a timeline. In the beginning, he was not working off a lot from us. All he knew was that the first section is historical — it’s Knute Rockne to Brian Kelly — and the second part is about this year’s team." So Mansour, a pianist and cellist from Santa Clarita, California (just north of Los Angeles), took his first stab. He already had some institutional experience after scoring the Boldly Notre Dame campaign video for the University Relations office, but sports posed a different sort of challenge for someone whose greatest connection with athletics came through playing the Madden football video game once in a while with his friends. “Over the summer, I would write free pieces, with no images, about 75 seconds each. I knew it would build to the end,” Mansour said. "The first draft — I think they liked the first 30 seconds, but they wanted to make the last 45 seconds more energetic. And as intense as possible. “Then in July, they sent a rough cut of the video, and that helped because we could sync up some of the elements. I was at home for a bit and in Maine, but with my laptop it was all portable with a little keyboard I work off of. Adds Bonner, "This went through quite a few revisions, but his first couple of versions were on spec, just off storyboard concepts. He really started to get it, even though he doesn’t know a lot about sports. In 2016, Mansour was selected from a group of 400 auditioning students to join the New York String Orchestra Seminar. The Irish football team viewed the latest rendition on that Wednesday prior to the Temple opener — and the consensus remained that it needed another dose of intensity. The irony of Mansour’s musical contribution is that its very design is intended to produce a level of excitement in Notre Dame Stadium that might actually drown out his creation. “The student section is always so rowdy and loud that I don’t know if anyone actually hears it,” he said. 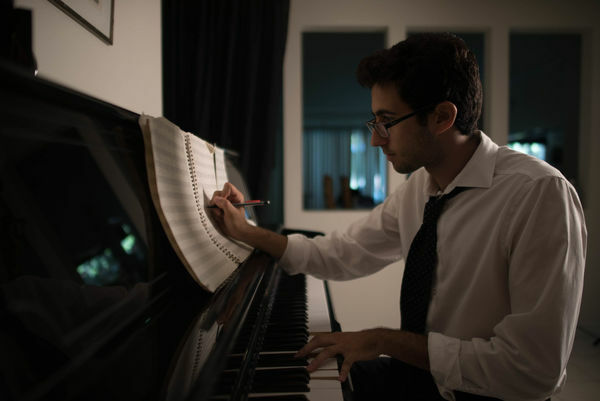 Mansour, who performs his junior honors recital Nov. 17 at Leighton Concert Hall in the DeBartolo Performing Arts Center, admits this assignment was a bit different than most he takes on because he was working to create something for clients who were not musicians. “The (development) campaign project was inspiring in a more gentle way, more orchestral. This was a heroic for a while, but at the end it’s about ’let’s throw someone through a wall.’ The fans need to be energized, not hear a John Williams score. This is not the kind of music I naturally tend to gravitate to, but I hope it delivered what they wanted. “The last four hours we spent on that final night were a really interesting vibe. Someone would say, ‘Stop — we need something there,’ either slow motion or fast motion. And at that point the video was set, so we were scoring. If Josh Adams was sprinting, when he hit the end zone, they needed a little something extra." Mansour definitely has a future somewhere in the music business. “I’m going to London next semester to take lessons with the Royal Academy of Music. That will expose me to a conservatory atmosphere. Or I could go to grad school and study composition — something geared more to chamber music for a concert hall. Or I could go to film school at a place like USC and get into film scoring, more of a business-oriented approach with films and commercials. That’s the Hollywood version. “Or if I get really lucky, I could immediately become an assistant to an established composer. Then you hope and pray they get a project they don’t have time for, that you might inherit. Originally published by John Heisler at al.nd.edu on November 17, 2017.